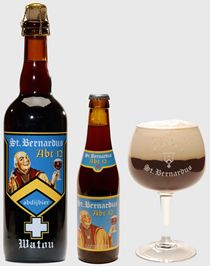 From St. Bernard Brouwerij– The absolute top quality in the hierarchy of the St. Bernardus beers. It is also the beer with the highest alcohol content (10.50 %). A dark ivory coloured beer with a high fermentation. The show piece of the brewery. Thanks to its soft and unconditionally genuine aroma, the beer can be smoothly tasted. The Abt has a very fruity flavour. St. Bernard Brouwerij – St. Bernardus Abt. 12 11.2 oz. bottle Poured into a beer glass. 10.5% abv. Appearance: Cloudy brown, like a melted Hershey bar with a huge, tan head. Aroma: Pumpernickel toast, sweet toffee and fresh fig. Taste: What you smell is what you taste; pumpernickel toast, sweet toffee and fresh fig. A bit of spice on the finish. Mouthfeel: Surprisingly fizzy on the tongue, yet leaves a nice coating on the roof of your mouth afterward. Overall: At 10% ABV, this is a great sipping beer. It’s sweet enough to be paired with dark chocolate for dessert and bold enough to be paired with a medium bodied cigar.